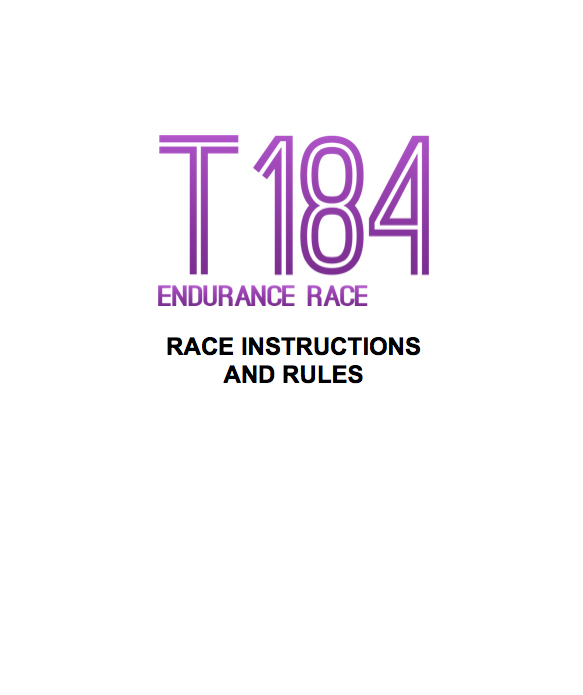 With the recent T1 Workshop and release of the rules for the T184 Endurance Run it’s got me thinking about preparation for this event, particularly with the kit requirements. I thought it would be useful to blog my initial thoughts on approaching this event and share this with other competitors to promote some discussion and debate. I reserve the right to change my mind based on further discussion and feedback! However, I wanted to document my thoughts way before, in the lead up to and after the event to see what went well and what could have been improved (i.e. the post mortem takes place). For those who haven’t heard of the event, the T184 Endurance Run is a new race on the Ultra Running calendar which takes place on August bank holiday later this year (which seems to be one of the most popular weekend for Ultra runs with the Ridgeway and Liverpool to Leeds Canal Run) also taking place at the same time. The event involves competitors setting out from the Thames Barrier on the Friday morning and covering a 184 mile distance of the Thames Path until the end finishing at the stone marker at the Thames Head within a time of 80 hours. The race is a little bit different in that all runners are self sufficient and will have to carry all food and equipment (although water is provided at checkpoints) for the duration of the race. 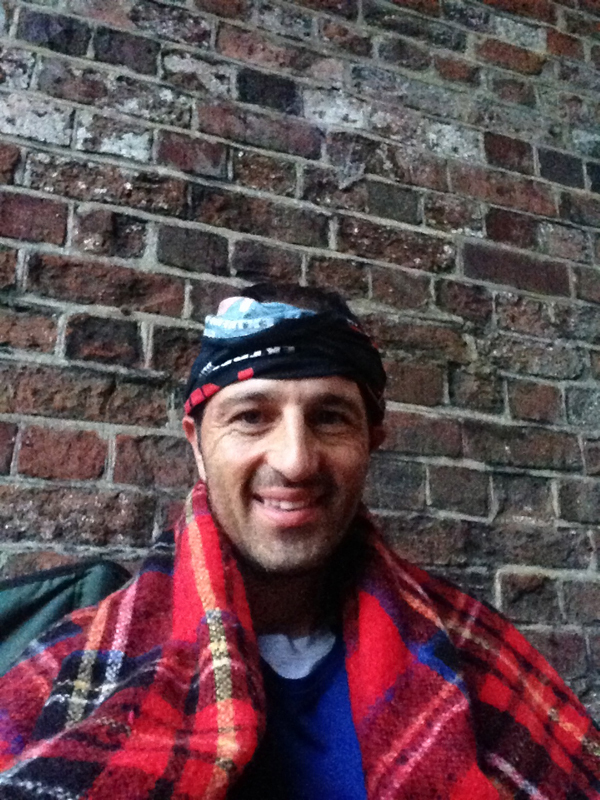 It’s similar to the GUCR in that that time limit is very very achievable (even walkable) to all long distance runners/hikers but the challenge will be to keep yourself mentally focused during the course of the event, especially over 2-3 nights. In addition, each competitor will be given a GPS device allowing competitors with web enabled devices and friends/family at home to track the event. Those people who followed the Spine Race earlier this year will know how interesting it was to follow the race from the comfort of your own home. (I’m not sure I want to admit how much I internet stalked Allan Rumbles that week). I’ve done some testing on the device (I used it at Spartathlon so my wife could track me) and I really think that the use of GPS devices (as they get cheaper, smaller etc) will start to be used more and more for these long events. Yes, technology is invading Ultra running… sorry to those purists who love the simplicity of just running. 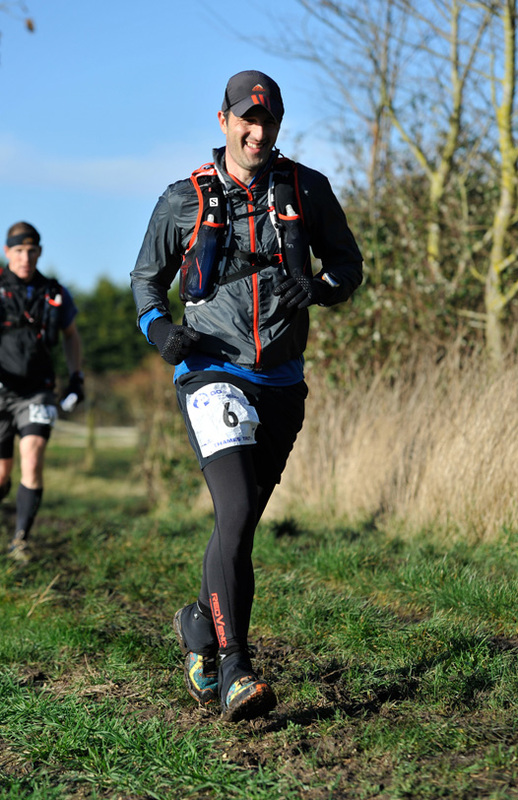 The Race Director is Shane Benzie of Running Reborn and whilst there’s always lots to prove with a new company running a new race, there is a genuine ambition to try develop this race into a classic UK ultra over time. I was asked to provide some input into the race from a runners perspective and we’ve had many discussions over the past year about different aspects of the race. For me it’s been really interesting to learn more about what goes on behind the scenes from issues like, insurance, risk assessments, permissions and general race logistics (I like this part as a Project Manager by trade). Back to the race itself and despite the forgiving cut off time, it shouldn’t be considered an “easy” event. I was chatting to a chap who was running the Thames Trot earlier this year who was training for the upcoming Marathon Des Sables. I was explaining the concept to him as the T184 is the sort of race that may appeal to those people doing the race. The conversation went something like..
MDS Man: “That sounds interesting”. Details of the race can be found at http://www.t184.co.uk and there are some places available if this sort of event is of interest to you. The field will be limited to 100 people in its first year. Following some consultation and discussion, the rules have now been circulated to the 80 or so runners who have already signed up to the event and now the event has started to get very real. In simple terms, competitors are required to carry everything they need at the start of the race and may not receive any support aside from water at each of the aid stations or locks en route. The event follows the Thames Path national trail and is marked for the majority of the route although I believe some temporary markings will be added for the last part of the course as the Thames River stops becoming a river and turns into a trickle. No crew or pacers are allowed. External assistance is forbidden. Supporters are welcome to provide morale support at Checkpoints however as long as no assistance is provided. Competitors must carry all their own equipment and food for the duration of the event and there is a mandatory kit list for safety reason. There are 7 checkpoints between 13 and 30 miles apart (longer at the start shorter towards the end) where only water will be supplied. Competitors may refill their water supplies at locks but are not permitted to stop off at a Café or Pub, visit Tesco’s, accept a sneaky Mars Bar from your wife, knock at someone’s house and ask for a cup of tea at night or visit McDonalds in the middle of Reading during the route. Competitors may rest and sleep at Checkpoints but must have left a before the stated cut off times. In all honesty, the no support and no collecting supplies during the run will be difficult to police during the event and will require an element of trust and honesty from the competitors. I suppose there’s the option of monitoring that GPS to see if someone pops into a Pub… or is that too Big Brother like? The challenge of the event is to do this by yourself and I guess people will only be cheating themselves if they try and bend the rules. How do you train for a 184 mile event? There’s no simple answer as people’s available time, work/life balance and even level of ability will all vary and be individual to that person. It’s not all about volume, focus on some quality sessions (room for improvement from me here! Increase mileage in the build-up before tapering 3-4 weeks out. Practice walking/hiking at a good speed. On the basis that I undertake a few large (100 mile) events during the year, I to try and maintain a good base mileage each week (anywhere between 50-70 miles per week) throughout the year with taper/recovery before and after a big event. So I can tick off the first point. I also use Marathons and smaller Ultra’s as build up events. I’m currently working towards the Thames Path 100/GUCR/South Downs Way 100 triple in May/June and am currently trying to get my mileage to peak in March before using the SDW50/VLM and the Enigma Marathon on Good Friday as my “slightly better effort than my usual Sunday plod” runs. I can’t say I run a lot of quality sessions to be honest so this is probably my biggest regret with training but I do try and run some hill reps a couple of times a week (one easy, one harder). I probably fail on point 5 as I do run with the odd niggle and probably don’t rest as much as I should. Finally, I do have a reasonable paced walk which has got me out of trouble a few times during my early Ultra runs when I was more towards the back end of the field than mid-table. Unfortunately (or fortunately as I’m looking forward to it!) I am running the North Downs Way 100 two weeks before the T184 (there’s so many events I want to run and so little time) so whilst I don’t have any doubts that I can complete the T184 I probably won’t be as well rested as I would like to be. However, the T184 was planned as my “fun run” of the year and I’m approaching this on the basis that it will be a grand adventure on a lovely summers weekend and if I end up walking a bit more than I would like than I won’t let it worry me. My experience of undertaking races over 100 miles suggests that 50% of entrants won’t make it to the finish line for various reasons. Getting yourself physically fit to achieve the distance is part of the answer but competitors will also need to be mentally strong. I blogged about this in a previous post here. Clothing: I will be taking/wearing a baselayer, running top, shorts, spare shorts (just in case “this” happens), leggings, socks, spare socks, light jacket and a warm layer. The key for me us to have lots of layers and a variety of options to take clothes on/off depending upon the weather. Ideally, I would have a variation of two sets of clothes just in case the heavens opened during the evening before I could get my rain jacket on and I got wet and cold going into a night leg. I might look at a Downs Jacket as a warm extra layer as these appear to be pretty light-weight with the OMM Rotor Smock an option having seen this at the T1 Workshop. Views on this welcome? Footwear: I will be wearing a pair of trail shoes. My likely choice for this race will be the Scott T2 Kinbalau as they are reasonably well cushioned and a comfortable fit. Water Proofs: I already own the Salamon Bonatti Jacket & Trousers so no need to pick anything else up. I sometimes carry one of these cheap plastic poncho’s which are useful to throw over yourself quickly. Getting soaked on the type of run should be avoided if you can. I have been guilty at times of not putting on my rain jacket thinking the rain will pass on a long run. Cap, Hat & Gloves: I might pick up one of those tighter fitting beanie hats rather than a woolly hat for weight and will also carry a light pair of gloves. Backpack/Hydration Pack: I do own an Invo8 18L Pack but this is likely to be too small to fit in all my equipment so may need to get a bigger pack or buy an additional large waist belt/pack. I do own some soft flasks which I use with the S-Lab pack and may use these to keep the weight down. However, I will carry one plastic bottle purely for making up energy drinks or For Goodness Shake powdered drinks which I like. Mobile Phone/Charger: I do want to check peoples GPS position mid-race to see how everyone is getting on and don’t want to run out of power mid-tweet so will take a separate charger as well as my phone. Route Description/Compass: The route description is supplied with a new map being handed out at each checkpoint but I will also carry a compass and Harvey Map of the Thames Path as I can have lock locations and water points mapped out. 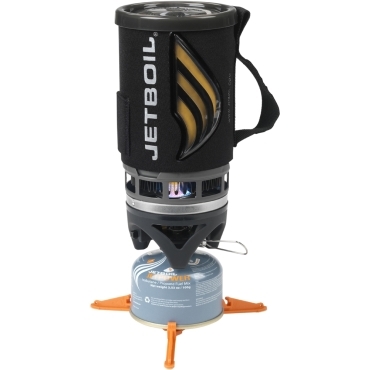 Jet Boil/Gas Cannisters: I think it would be beneficial to have hot food during the run and the JetBoil looks a good option as its about the right size, looks quick (2 mins to boil) and easy to use (no matches). If anyone owns or has used these and has some impressions then please let me know. 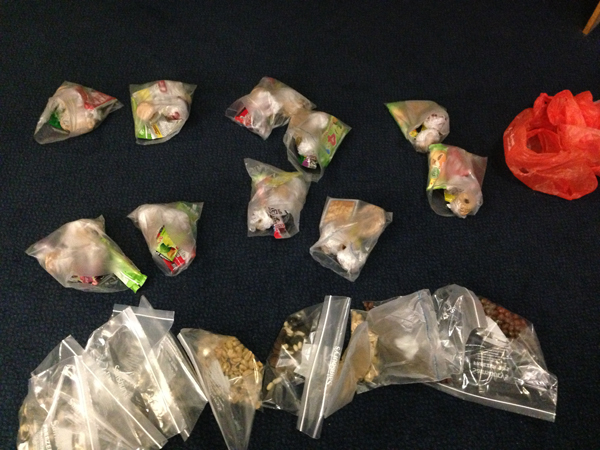 Food: The plan is to use freeze dried meals (aiming for 3 per day i.e. breakfast, lunch and tea) and then take some snacks to eat between checkpoints (i.e. nuts, raisans, energy bars, – whatever I like and is portable) aswell as some powdered milkshake drinks (For Goodness Shakes – I’m a fan of these). I will likely split the snacks up into small freezer bags in advance which I can carry individually and try and consume 1 bag between each checkpoint so I don’t have to keep dipping in and out of my pack every five minutes. Money/Cash: I will carry a few quid for an emergency or a beer at the end but not that much so please don’t try and hunt me down on the GPS and rob me. GPS Device/Garmin: Carrying the GPS device is mandatory and I will also carry my Garmin and charger to keep an eye on how slowly the miles tick by. Survival blanket/Foil Blanket: I may need to get a new foil blanket one as I used my last one on the Thames Ring and it never ever folds up neatly after use. First Aid Kit: I would suggest a Travel First Aid kit is sufficient with some septic wipes, tape, plaster, bandage, dressing, scissors/multi-tool, tape (RockTape), ibuprofen and some compeeds. The First Aid kit is primarily to deal with minor cuts, stings, bites and wound type injuries. Anything more serious and it’s a x999 call. iPod & Headphones: I own an iPod Nano with a 30hr battery life so that should get me through a couple of nights. Other: A few other items include sunglasses, perhaps a flannel (to wipe your feet) when changing socks, toothbrush and toothpaste, some foot powder (odour eater powder soaks up moisture quicker than plan talcum powder). You may think that the weather will be quite nice on an August Bank Holiday weekend (and I hope it is). However, having run the Ridgeway Challenge on the same weekend in 2011 and 2012, we had rain and thunderstorms so competitors needs to be prepared for all eventualities. Oh, just to give you fair warning I will be wearing my “lucky” hat. I’m constantly learning more about looking after my feet from having some pretty bad experiences during my early ultra running days. 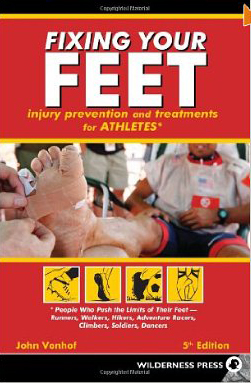 I finally picked up and read the “Fixing your Feet” book and the key message for me was the preference for soft and supple feet which meant a change from my current approach of using lubrication (sudocreme) to minimse the chance of friction. I will be looking to use a combination of methods to protect my feet. Firstly, 184 miles of walking or running will mean your feet will be sore and for long races I prefer the use of cushioned shoes ideally with some good underside protection. This year, I am going to try a combination of taping my feet, using a lightweight injinji sock (to stop my toes rubbing) with a light Drymax trail sock over the top (i.e. 2 thin layers of socks). I have used compeeds on my feet at the start of the race on the usual hotspots which can be effective but if you do get a blister underneath a compeed then it is a pain to get this off without ripping the skin off the blister. I’m also a little fed up of trying to remove bits of a compeed plaster from my socks which you can never really achieve. I usually adopt an approach of changing my socks every 50 miles (so once in a 100 mile race). So I could be looking at 3 sock changes during the T184. I have a number of 100 mile races before the T184 so this will give me a chance to refine my approach here based on experience. As a final note, I may carry a small flannel to help clean my feet during use and perhaps some odor eater powder (as it soaks up moisture better than talcum powder) as part of my kit. In terms of sleep, I will definitely try and grab at least an hour or two each night and if I end up sleeping a bit longer then fine. I’m picturing crashing out for an hour in a lovely meadow looking up at the stars as my hot food is being prepared. In reality, it’s more likely to be wrapping yourself in all your layers due to the cold and then stuffing yourself in your bivvy bag as the rain pours down whilst constantly fidgeting as you feel every bump and stone in the ground. My experience during the Thames Ring was to get an hour or two each night. I completed that event in 82-83 hours on the back of 1 hr, 1 hr and 2 hrs sleep each night despite me trying to sleep longer (5 hours) each time. At the end of the event I was still pretty coherent and articulate but eventually did succumb to the sleep monster when I got home and was wasted for the next 4-5 days! As I’m not planning on sleeping a lot, then it will be minimum comfort and try and grab a few hours where I can. 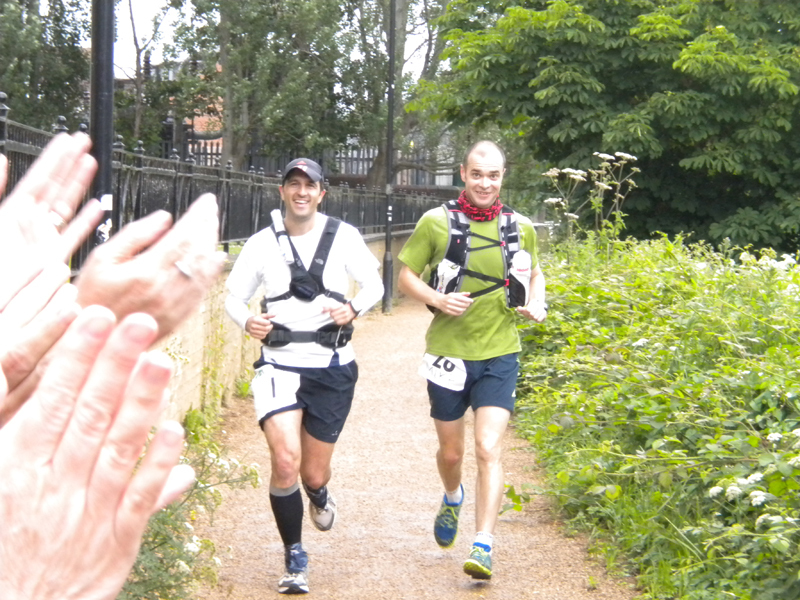 How do you plan to tackle a 184 mile race? I struggled with developing a race strategy when I was planning the Thames Ring as the when to sleep/how much sleep variable meant I couldn’t be that precise on where I thought I would be at certain points and it would largely be dependent on feel. You also have to consider the speed at which you will be travelling will be slower than say a 100 mile run as you will be carrying all of your kit and you will slow as sleep deprivation rears its ugly head on days 2 & 3. I haven’t quite plugged the numbers into an excel spreadsheet in fine detail but will probably look at this based on a 3-4 mph speed and add on an average of 1 hour at each checkpoint to allow for a mixture of brief stops (say 30 mins) or a couple of slightly longer sleep stops. The following table shows the Checkpoints and cut off times. Based on the above assumptions, my simple plan starts to look like this. This would result in just over a 60 hour finish and allows 7hrs for stops/sleep at Checkpoints wherever these may occur. If I mentally rehearse how this race will go, starting at the Thames Barrier at 10.30am and then moving through (a possibly busy) London to CP 1 at Brentford. I’m likely to pause briefly here for food and then push on to CP 2 following the Thames Path when it has exited the city as it gets darker and quieter before arriving here at night before eating and then moving onto CP3 where I may grab an hour or two’s sleep. So, far the terrain is pretty familiar as I’ve run the Thames Path 100 a couple of times. After CP3 at Henley, its very familiar territory as I pass through my hometown of Reading ignoring the lure of Tesco’s Supermarket which is positioned right next to the river path and follow the route through Reading, Mapledurham away from the river at Whitchurch and then onto Streatley. If it’s around Saturday afternoon as planned, it’s a brief stop for food and water and move onto CP5. I’m assuming the pace will drop after 100 miles and this could a killer leg from Streatley to Oxford but should be familiar to those who have run the Thames Trot or Thames Path. A brief rest at CP5 may be required as we may be into the second night before the final push through CP6, 7 and to the finish hopefully just before the third night. I’m not familiar with this last section after Oxford so a recce may be in order as I understand it gets a little wilder as the Thames River and footpath disappears. Despite a rough plan, you will have to be flexible on the day as you may need an hour or two’s sleep earlier than expected or you may feel alive and alert and push through. I will repeat some advice I was given before the Thames Ring to grab at least an hours sleep on the first night, this worked well for me. It is probably worth trying to get to a Checkpoint for sleep just for the security of having someone around to watch your back. Again, referring back to my Thames Ring experience I did try and sleep in a field for an hour or two between Checkpoints using two space blankets (one to lie on and one to cover myself) but it didn’t really work and after faffing around for half an hour trying to get comfortable, I pressed onto the Checkpoint. You should all be prepared to complete this event solo but if there is an opportunity to buddy up or tag along when this is well worth doing to help pass the time (or share in each other’s misery). 60 hours by myself on the Thames Ring wasn’t a lot of fun but if you do find yourself in this position then some music, mind games or the odd phone call can help break up this monotony. With a few months out from the race, my current focus is on training, completing other races and keeping fit and injury free. However, I am looking forward to the event in August. I will be looking to pick up some kit and equipment I need over the next few months and trying this out before the T184 event itself before I start to fine tune my thoughts closer to the race. If any other T184 competitors want to provide some feedback then I would be interested to hear from you. At the very least I hope you found this article of interest. I’m not doing T184 – but am doing T60 and also Ultrarunning Limited’s the Thames Challenge, (which does the route in reverse over 4 days) in early August… It might be worth tracking me down after that if you have concerns about the course! Thank you for sharing this insight Paul. I was actually planning to run this event eventually but still have to complete my first 100 miler (Cotswold Way) and might plan to do the Thames 100 Centurion event first.